Roots-blown up to 90 years ago! The supercharged Mercedes of the 1920s and 1930s were stunning cars. Here’s why. Shortly before the end of World War I, Paul Daimler, son of automobile inventor Gottlieb Daimler and Chief Engineer at DMG (Daimler-Motoren-Gesellschaft mbH), equipped the Knight sleeve-valve engine of a 16/50 hp Mercedes with a Roots blower. He drew on the experience gained with superchargers in aircraft and submarine engine production during World War I, where the mechanical air compressor had been used to compensate for power losses at high altitudes. However, the sleeve-valve engine proved to be unsuitable for combination with a supercharger. Tests were made with supercharging the large six-cylinder 28/95 hp Mercedes engine with a displacement of 7.3 litres, which generated 140 hp (103 kW) with a supercharger. The results of these experiments were promising. 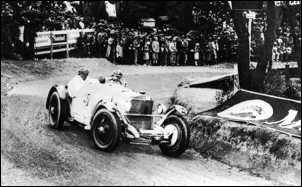 In 1922 a Mercedes with the supercharged 28/95 hp engine was entered in racing for the first time, in the Targa Florio, and Max Sailer drove the car to victory in the category of production cars of over 4.5 litres. Even before that, Paul Daimler had experimented with the small 2.6-litre four-cylinder 10/30 hp Mercedes which caused quite a stir at the 1921 Berlin Motor Show where it was displayed as a supercharged 10/35 hp model alongside the 1.6-litre four-cylinder 6/20 hp. Another two years would pass before production maturity was reached. In the cars renamed 10/40/65 hp (pictured) and 6/25/40 hp in 1924, the supercharger boosted output by a good 50 percent. However, the technology was extremely complex at the time and therefore came at a high price. 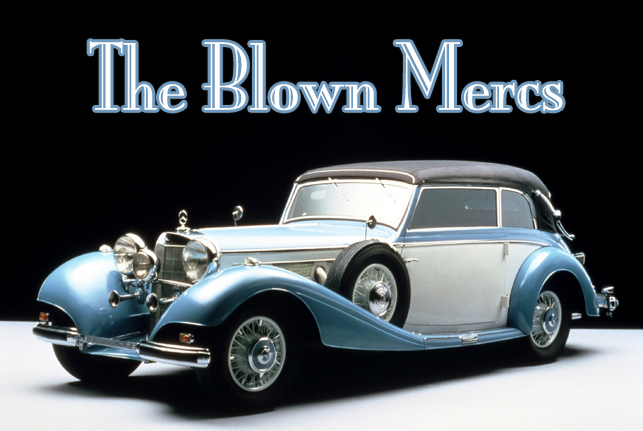 The first supercharged Mercedes models were very expensive cars in their day and age, and only modest numbers were sold. When Paul Daimler left the company founded by his father in 1922, Ferdinand Porsche took over as Chief Engineer and continued Daimler’s work. He, too, swore by supercharger technology, knowing that the sophisticated blower system was primarily suitable for high-performance and luxury cars. Consequently, Porsche’s first designs for DMG were luxury cars – the pictured 15/70/100 hp Mercedes and the 24/100/140 hp Mercedes (the latter being available in six different bodywork variants). The engines featured light-alloy crankcases and cylinder liners and cylinder heads made of gray cast iron. As was customary at the time, the first figure in the names indicated the tax horsepower rating (which depended on displacement), the second the engine output in naturally aspirated operation, and the third the output with the supercharger engaged. When the two Porsche designs with four-litre and 6.3-litre six-cylinder engines were introduced at the Berlin Motor Show, they ranked among the most powerful road-going cars of their day and age, courtesy of their Roots blowers. They were surpassed by a car from their own ranks, the 24/100/140 hp Mercedes-Benz K built from 1926; its two predecessors – renamed Mercedes-Benz 400 and 630 – remained in the range for the time being after the merger of DMG and Benz & Cie. in 1926. In contrast to the supercharged eight-cylinder Mercedes-Benz cars launched at a later stage, the “K” did not stand for ‘supercharger’ (Kompressor in German) but stood for ‘short’ (kurz in German) to refer to the car’s 35 centimetre shorter wheelbase. 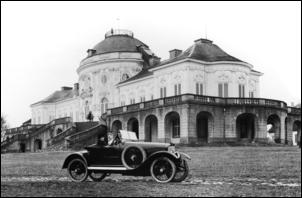 Other versions available were the 620 K and 630 K, both with 24/110/160 hp; the 630 K had a top speed of around 145 km/h and was thus the fastest production car of its time. The 680 K was made available with 26/120/180 hp engine and as a racing car only with 26/145/270 hp engine. Incidentally, the special feature of the K models was the arrangement of three silver-coloured exhaust pipes on the outside of the engine hood on the right-hand side and serving as a visual hallmark of the supercharged Mercedes-Benz models. Despite all these superlatives, the supercharged Mercedes models of the early years were merely tentative exercises for what Daimler-Benz would produce from 1927: the Mercedes-Benz S, SS, SSK and SSKL. When brothers Francis and Philander Roots filed a patent application for their blower in 1860, they had no idea that their charger would once become the stuff of automotive legends. The two manufacturers from Connersville in the American Middle West had actually only intended to boost the output of the water turbine in their spinning company. Their rotary-piston blower is the prototype of all Roots blowers as they are still being used in automotive production today. On principle, the Roots blower works like a gear pump. However, instead of two intermeshing gear wheels, two counter-rotating rollers with octagonal cross-sections are used to deliver the gases. The rollers operate with small clearances in a casing whose interior basically consists of two hemispherical parts which are connected at a certain distance. The gases are compressed by the delivery pressure. 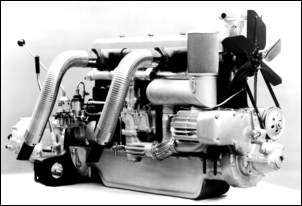 The supercharger is driven by the crankshaft – in the Mercedes-Benz 500 K, for instance, it rotated at four times the engine speed. When such a Roots blower is installed as a pressure charger ahead of the carburettor, it presses pre-compressed air into the carburettor where it is mixed with fuel. The advantage over a carburettor without upstream supercharger is that the Roots blower raises the cylinder charge through pre-compression – and a higher charge produces more power. A suction-type supercharger mounted behind the carburettor operates according to the same principle in that it is a so-called wet charger which compresses the fuel/air mixture. The effect is the same as in the case of the pressure carburettor. Its advantages come to the fore in racing where the suction-type supercharger copes with higher loads thanks to the better interior cooling of the fuel/air mixture. The production cars of Mercedes and Mercedes-Benz always featured pressure-type superchargers which were easier to service. In the Mercedes-Benz 500 K, for instance, they generated a pressure of 0.3 bar and boosted output from 100 naturally-aspirated hp (74 kW) to 160 supercharged hp (118 kW). 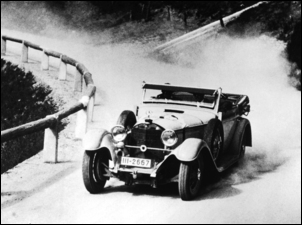 The Mercedes-Benz S, which had been developed in Untertürkheim since February 1927, made its first public appearance in the opening race on the Nürburgring on June 19, 1927 – and crowned its debut with a double victory. It thus underpinned its claim to replacing the 630 K as the fastest passenger car in its day and age. With model designations Mercedes-Benz S, SS, SSK and SSKL, the supercharged models built from 1927 went down in history. No other contemporary road-going vehicle was capable of such high speeds while at the same time being as robust, reliable and long-lived. Based on the 630 K and the further developed version, with a vertical-shaft six-cylinder, displacement enlarged to 6.8 litres and lowered chassis, the S surpassed its predecessor in every respect. Without the supercharger engaged, an early version of its engine with overhead valves transferred as much as 120 hp (88 kW) to the rear wheels. And when the accelerator was pressed down beyond the full-throttle point, the Roots blower driven by bevel gears was engaged, causing the multi-plate clutch to transmit a mighty 180 hp (132 kW). Overall, Mercedes-Benz built 146 units of these S sports cars with the designation 26/120/180 hp – as two-seater racing cars, open tourers and comfortable convertibles. However, as early as 1928 the 27/140/200 hp SS, internally known as W 06, was launched. With a compression ratio raised from 4.7:1 to 5.2:1, the engine, fitted with double (magneto and battery!) ignition, generated 20 hp (15 kW) more than the first version. Between 1928 and 1930, 111 buyers raised the 35,000 Reichsmark charged for an SS model. While the single S stood for ‘Sport’, the double SS denoted ‘Super – Sport’. A displacement enlarged to 7.1 litres, light-alloy pistons, a larger valve diameter and output ratings of 200, 225 and 250 hp (147, 165 and 184 kW) fully justified the ‘Super’. This power-pack was surpassed only by the Mercedes-Benz SSKL (W 06 RS) – a thoroughbred sports car with a mighty 300 hp (221 kW). Thanks to numerous weight-shedding measures, the car was some 200 kilograms lighter than the SSK which weighed in at 1.7 tons. Its drivers enjoyed a whole string of victories in the Mille Miglia (Rudolf Caracciola, 1931) and many other major races in the 1920s and 1930s. The Mercedes-Benz 380, 500 K, 540 K and 770 mark the pinnacle of technical progress in the 1930s. Here are the ‘Mercs’ of motoring mythology [...] The three great exhaust pipes emerge from the bonnet side to be copied by all and sundry who wanted to make a Mercedes-like impression. Here the great three-pointed star rides so big and large before the driver that it becomes almost a fighter pilot’s sight. And nowhere else but in a fighter plane could one sit behind so much engine. In his book The Mighty Mercedes published in 1971, technical author Michael Frostick described the appearance of the supercharged Mercedes-Benz models. Mechanical engineering at its best, world-class bodybuilding and previously unknown levels of luxury – these were the hallmarks of the Mercedes-Benz 380 (W 22, 1933 - 1934), the 500 K (W 29, 1934 - 1936) and the 540 K (W 29 and W 24, 1936 - 1939). The Grand Mercedes, model 770, was optionally available with a supercharger, and hardly a customer failed to order it. While the S, SS, SSK and SSKL had impressed people with their aggressive appearance and sheer power, the mighty luxury cars bewitched people with refined grandeur. 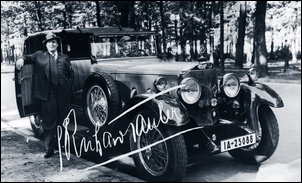 The supercharged new-generation cars designed by Chief Engineer Hans Nibel were less suitable for sporting achievements – instead, their strengths lay in extremely comfortable and relaxed travel at high average speeds. The 380 was launched in February 1933. It was available with different engine versions – three of these with supercharging. 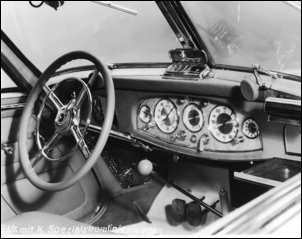 The 380 was the first to feature a four-speed transmission with the top gear designed as overdrive. Several different bodies were available ex factory: sedan, tourer, sports roadster and three different convertibles. This was also the first time that independent wheel suspension all round ensured excellent handling and ride characteristics in a car of this size. In 1934 the 380 was replaced by the more powerful 500 K. The eight-cylinder in-line engine of the 500 K – and of the 540 K at a later stage – was over one metre long and consisted of a special sound-absorbing grey cast iron. The grey cast iron cylinder head used parallel overhead valves, actuated via rocker arms and push rods from the lateral camshaft. However, this high level of mechanical refinement came at a price in the form of weight: the complete eight-cylinder engine of a 500 K weighed more than 600 kilograms. Both the 500 K and the 540 K available from 1936 were offered with two wheelbase lengths. The short chassis with a wheelbase of 2.98 metres served as the backbone for the sporty roadster and coupe versions as well as for the short convertible A version of the 540 K.
The long chassis with a wheelbase of 3.29 metres was available in combination with all bodywork versions. In their design work, the bodybuilders in Sindelfingen pulled out all their stops. Snake-skin seat covers, mother-of-pearl inlays in the dashboard, conspicuously sweeping fenders – everything was possible. Even the standard range with more than ten bodywork versions – from the streamlined coupe via sedan and open tourer to convertibles A, B and C and the sports and special roadsters – left hardly anything to be desired. Over and above this, the 540 K was also available as motorway courier with streamlined bodywork. At 160 hp (118 kW) with the supercharger engaged, the output of the 500 K was already more than lavish by contemporary standards, but the 540 K built between 1936 and June 1943 capped it all off with displacement enlarged by 0.4 litres, output with the supercharged engaged increased by 20 hp (15 kW) and, most importantly, with a major boost in torque. The 770 Grand Mercedes was the largest car in the company’s model line-up. It would hardly have been possible to travel in a more refined and more luxurious style. The first W 07 series (1930 - 1938) was available with or without supercharger. With supercharger, the eight-cylinder engine generated 200 hp (147 kW) from a displacement of 7.7 litres. In this car, the supercharger was not meant to give the car a sporty performance but served as a highly welcome acceleration aid – the car did after all weigh around 2.7 tons, depending on equipment. 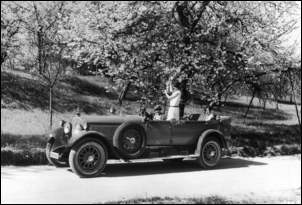 The second version (W 150) with light-alloy eight-cylinder engine was launched into the market in 1938 and continued to be built until 1943. The engine developed 155 hp (114 kW) from a displacement of equally 7.7 litres – and 230 hp (169 kW) with the supercharger engaged.